Kaziranga National Park is an incredible story of conservation success. 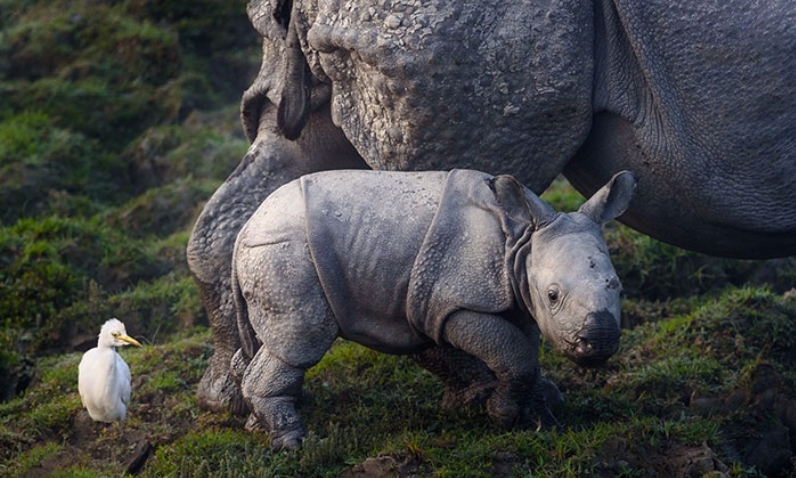 Kaziranga National Park is a story of success when it comes to conservation of rhinos – but what they’ve done to achieve it is allowing its workers to shoot and even kill potential poachers. So far, the park has killed 50 poachers. Rhinos are safe there – a century ago, there was only a handful of Indian one-horned rhinoceros. Now, the park hosts more than 2,400, which is two-thirds of the world’s population. However, little is talked about the fact that in 2015, more people were shot dead by park guards then the number of rhinos killed by poachers. These people all went after rhino horn, as they could be sold for as much as $6,000 for 100g and are considerably more expensive than gold. They are mostly marketed as a miracle cure for everything from cancer to erectile dysfunction. "The instruction is whenever you see the poachers or hunters, we should start our guns and hunt them," Avdesh explains without hesitation. Conservation efforts in India tend to focus on protecting a few emblematic species. The fight to preserve them is stacked high with patriotic sentiment. Rhinos and tigers have become potent national symbols. Responses to "Kaziranga: The park that shoots poachers to protect rhinos"
This is excellent punitive and deterrent practice which should be undertaken elsewhere, as well. Also, use drones for a bird's-eye view, fitted with low-light / night-vision to catch poachers under the cover of darkness. Poachers clearly have the option not to be there and get shot. It's their choice. Shoot them. It is crucial to protect the rhinos, absolutely! It is also crucial to understand the poacher's incentive- yes, some poachers are just evil greedy monsters- and they deserve to be shot for poaching. BUT- some poachers are native people- husbands and fathers- and they have starving children who they are desparately trying to save by killing animals that they can sell fo buy food for their families. These men need HELP. This has been proven and there is a wonderful solution- hire these fathers ! Let them use their excellent tracking skills to PROTECT the rhinos, the elephants, or any of the species in dire need of help! These men have the greatest knowledge of anyone about how to think like a poacher because they have been poachers. Use that to wildlifes advantage! It is a win/win. One more thing- to those of you suggesting "drones" and "night vision cameras"- Wake up! and look outside your comfortable bubble! You have such a privileged life compared to much if not most of the rest of this planet! The African government involved barely has the funds to help its starving people, let alone to purchase high tech gear . The poachers are aware of the dangers, so if they still choose to risk being shot,it's their choice. The rhinos don't have that choice. @Animal Friendly: Kaziranga Park is in Assam, India, not in Africa. I'd join those park rangers! I agree that the if there are men who are doing this to make money to feed their families (although I don't know how many this effects or if this is really true) then yes pay them to protect the animals instead but I wonder if they, who are used to killing the animals and have not had the conscience to care that they were destroying a species, if they would not turn a blind eye in order to get extra money. I wonder if once you are a poacher if you can turn around and be a protector. If you can, then that is a wonderful idea. Personally, I have no problem with the idea of shooting poachers. Ideally I wish there was a way to shoot a vial of something that would create empathy in poachers so that they would never harm a living thing again...but that is only a dream. So yes, sign me up... I would definitely hunt and shoot poachers (but not sure I could purposely kill them). I'm pleased to see how many people comment on this article and support protecting the rhinos. Like others have said, they know what the risks are and if that doesn't deter them from these horrible acts, then too bad for them. I don't like the idea of killing a person, but it gets to the point where "enough is enough" and drastic action has to be taken against evil people. Wonderful! Continued education and protection is a welcomed approach. I support the efforts of this park and thank them for their measures to protect these creatures. I hope that natives can join in the protection of their (our-world) animals. I am happy to see that the value of human life hasn't overshadowed the value of diverse animal life. Chicago would do well to learn this lesson. to bad we can't implement this against gangs that kill innocent people, such as KKK, BLM, Islam Terrorists, etc. Good. I wish they would adopt that policy here in the US as well. Kill them all! I agree with other posters. You know the potential consequences of your illegal actions. Mouths to feed or not. I'm sure there are plenty of others who starving and not poaching endangered animals. You always have a choice. AnimalFriendly: " African government involved barely has the funds to help its starving people, let alone to purchase high tech gear." At first glance, I thought we, Nepalese, should have emulated the same radical approach to protect or safe guard our Rhinos. However, on the second thought, I can't fathom this radical approach of killing poachers who are still humans to protect animals. Sure this poachers are conducting criminal act and logically they should get prison time, but shooting and executing them sounds extreme. I understand there are dependency between animals and human which is necessary to balance our sustainability. Sorry but the fact of the matter is human lives out weights animal lives. Hence, this execution should be halted. I am not we shouldn't apply any measures to it, but it should done using the rational approach.I think it's time to rethink the procedures, and develop better protocols to protect these rhinos and human beings together. I have very little sympathies for the poachers. The parks are conservation areas and people who enter for the sake of killing (whether for money or for trophy) should be dealt with severely. This park had decided shooting and killing is justified. I believe if nothing else, it acts as a possible deterrent for others and we know for sure the one that was shot dead won't be coming back to do it again. wished they could go after the market , good too see something is being done at least in one place wished all other wild life conservatives / parks ect. would do the same i have seen wire snares in Kenya not pretty ! Hey, they knew the job was dangerous when they took it. They won't poach anymore when they're dead. would like to see more of this needs to b done every where wild life is abused too bad they can't go after the consumers ! It's a shame it has come to that BUT something had to be done to stop the idiots from killing these protected species. It has shown that this idea has slowed the poaching down, whatever works my friends, whatever works. Poachers can now see what it's like when the shoe is on the other foot! Good enough for them. I also like the idea of using this for the rabid fools that run rampant in our country as well. Choot em Lisbeth, Choot em! I saw a video on Instagram two days ago of a small rhino which had the top of his head removed with a chain saw. IT WAS STILL ALIVE!!! and left to suffer. Hell, I would have killed the poacher myself if given the chance. Reap what you sow. I'd like to address some of the comments above: Kaziranga National Park is a national park in the Golaghat and Nagaon districts of the state of Assam, India. NOT Africa. Poachers generally are from neighboring states. While some may say that impoverished villagers are the culprits, AK47s have been used to kill the rhinos, not a gun a villager is likely to own. Poaching is big business. And yet, IF CUT HIGH ENOUGH ON THE HORN, THE HORN REGROWS!! The most recent price for rhino horn I could find was from October 2016. It sells for $3,000 a pound at first sale by poachers and up to $30,000 a pound in final processed form, though prices go much higher when sold by the gram. In 2016, Kaziranga rangers arrested 64 poachers and killed 5. The park is 25,000 sq. Km (9,600 sq. miles) and has 1,247 rangers, and 178 anti-poaching camps as well as electronic eye surveillance. DNA profiling of all rhinos in park's population will permit tracking the rhino horns when sold, to aid prosecutions. Absolutely love this! I say kill every last one of them. If only we could bring this form of justice to bear on those guilty of animal cruelty. I Totally agree with this. It should be implemented in every park where poachers are ruthlessly slaughtering defenseless animals to make a quick buck.They are well aware of what they are doing and have no concern that they are causing these species extinction. Rangers keep up the good work. What an absurd medieval childlike idea that rhino horn will cure something like cancer. Also horrible that men would let a species go extinct because of erectile disfunction. This whole concept of grinding up everything in your path like caterpillars for greedy self serving purpose needs to be stopped. You people saying they should pay poachers to protect animals are delusional. 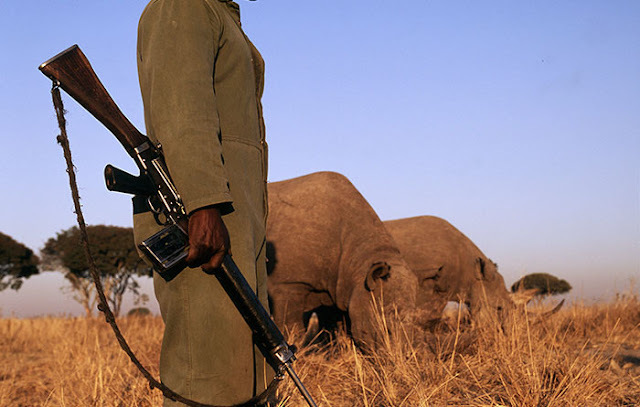 The poachers get paid WAY more than the park rangers do. You really think they’re going to give up the kind of money they make from poaching for a meager paycheck? Poachers are not nice people, even if they are fathers or family men. They will kill YOU without batting an eye just to get their target. They’re involved in drug trafficking and terrorism as well. It’s a huge dark network of shady, ruthless people who care nothing about the lives they coldly extinguish in order to earn their blood money. There is no changing them. They deserve to get snuffed out, and them having kids to feed is a b.s. excuse for wildlife terrorism and poaching. They could make an honest buck elsewhere but they are greedy for the big time blood money their victims help them rake in.